Trials in the Manjimup region of Western Australia indicate that changes can be made to rates and application methods to optimise fertiliser use. Changes to application methods include strip incorporation of granular fertilisers and the potential for using liquid phosphorus for pre-transplant application. Fertiliser is a major input cost in vegetable production along with labour and seedling costs. Optimising fertiliser rates and application methods is important to gain maximum benefit. The following information is based on trials carried out on broccoli and cauliflower crops grown in karri loams at Manjimup, about 300 kilometres south-west of Perth, Western Australia. Phosphorus is a key nutrient that needs to be carefully managed before planting in the loam soils around Manjimup. These soils retain, or fix, a large amount of phosphorus. After application, the phosphorus reacts chemically with iron and aluminium exposed at the surface of soil components (such as clays, oxides and organic matter) to form insoluble compounds that are less available to plants. Phosphorus must be applied in the soil pre-plant for it to be adequately available to a crop. Cauliflower and broccoli plants require good phosphorus nutrition for adequate growth. Phosphorus is involved in processes such as cell division and providing energy for other chemical reactions. Phosphorus is needed early in a plant's life when the first cells for future roots, stems, leaves and flowers are produced and adequate supplies are required to achieve maximum potential yield. Plant roots take up phosphorus from the soil solution as water-soluble phosphorus. It can only be taken up from moist soil. For all methods of application, using a fertiliser containing an increased concentration of water-soluble phosphorus will increase the amount of readily available phosphorus for plant uptake. The amount of water-soluble phosphorus can be determined by looking at the chemical analysis of the fertiliser written on the bag or asking for the analysis if purchasing bulk supplies. Pre-plant fertiliser rate trials in Manjimup and a grower survey have found that many growers could potentially reduce their fertiliser rate without impacting on crop yield or quality. Trials found the optimum basal phosphorus rate for a cauliflower crop on loam soil was 100 to 120kg per hectare using the recommended strip incorporation application method but many growers are using 175 to 300kg of phosphorus. Fertiliser needs vary from farm to farm and even paddock to paddock depending on cropping history, past fertiliser applications, soil type, crop management and post-planting fertiliser applications. To determine the right rate for your situation you can trial different rates in small strips to assess if basal fertiliser rates can be reduced without impacting on yield or quality. Rate trials on cauliflowers conducted by the Department of Agriculture and Food involved three commercially available nitrogen, phosphorus and potassium (NPK) fertiliser products. Each product was applied at five rates ranging from 800 to 1600kg/ha. Each product contained between 7% and 12% phosphorus. For all three fertilisers the optimum rate to apply was 100 to 120kg/ha. Applying higher rates did not produce a significant increase in either yield or curd quality. These fertiliser application rates are lower than commonly used in commercial practice. If choosing a pre-mixed fertiliser product, always check the amount of each nutrient it contains. In the trial, regardless of which product was used, about the same amount of money was spent to apply the optimal phosphorus rates. Using a cheaper product necessitated applying it at a higher rate and so no savings were made. A similar trial was conducted with broccoli but using only one basal fertiliser product. Based on the yield achieved and cost the most efficient rate of phosphorus to apply was 125kg/ha. Slightly higher yields were achieved with higher rates, however the small increase in yield did not provide enough return to cover the increased cost of fertiliser. It might be expected that a broccoli crop would require less phosphorus than cauliflower, but a soil test for these trials showed a difference in soil phosphorus prior to planting. The broccoli site had 73mg/kg of phosphorus compared with 163mg/kg for the cauliflower site. This shows the potential impact of residual soil nutrient levels on fertiliser requirements. Preliminary trials have been conducted in Manjimup comparing granular and liquid fertilisers as pre-plant fertilisers for cauliflower. In one trial there was no yield or quality difference between liquid and granular fertilisers. A second trial comparing a commercial NPK blend with two liquid products found the granular treatment increased average marketable curd weight and total yield compared to either of the liquid fertilisers. At the time, the cost of liquid fertilisers and liquid phosphorus in particular, meant there was no economic benefit to using liquid fertilisers when there was no yield advantage. This may change if the relative difference in price between liquid and granular phosphorus changes. There may be benefits in transport, storage and handling of liquid fertilisers, which are regarded as more convenient by some farmers. For brassicas such as cauliflower and broccoli, fertiliser placement on loam and clay soils was traditionally in two narrow bands. The bands of fertiliser are placed either side of the seedling transplant, slightly below and offset from the seedlings. An alternative method for these crops is an incorporated strip. The fertiliser is applied to the soil surface in a strip about 15 to 20cm wide and incorporated into the soil to a maximum depth of 15cm with a small rotary hoe. 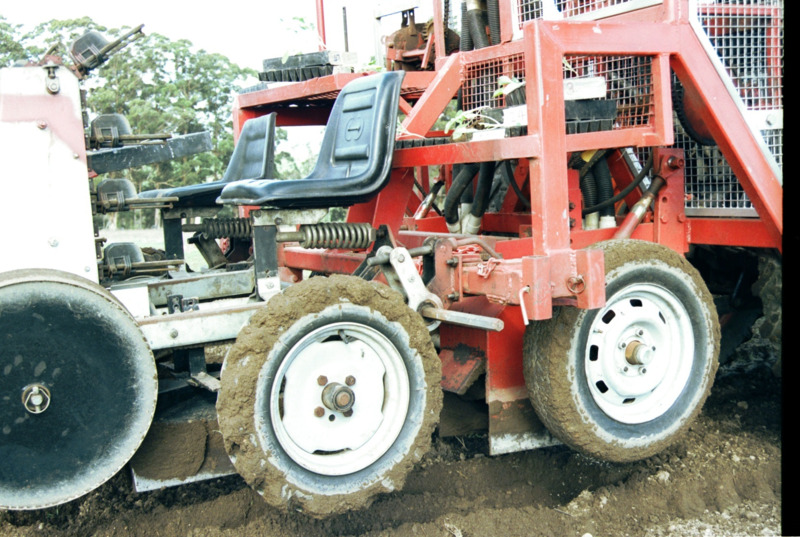 The number of small rotary hoes fitted to the planting machinery depends upon the number of rows of crop to be planted by each pass of the machine. One row of cauliflower or broccoli is planted in the middle of each of the rows of the incorporated fertiliser. 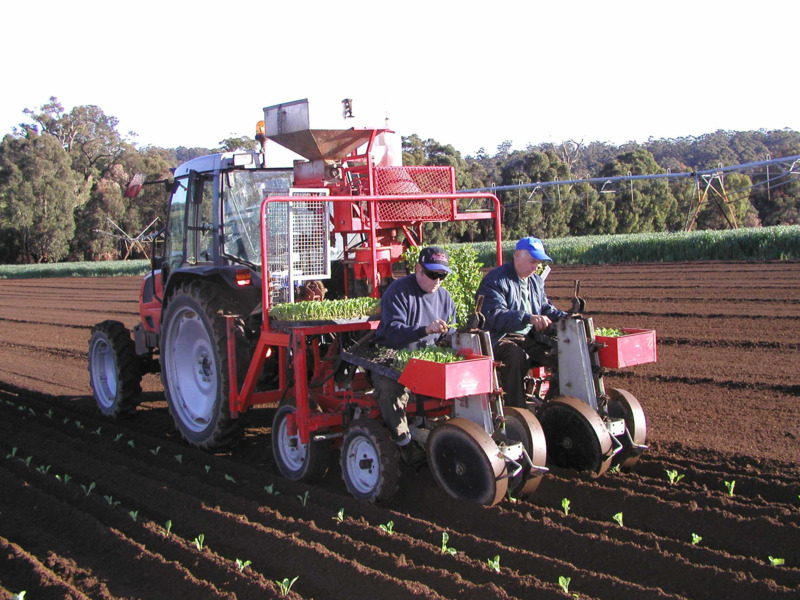 Existing vegetable planting machinery can be modified to fit the rotary hoes. Placing fertiliser in narrow bands concentrates the fertiliser in a small volume of soil, so proportionately less phosphorus dissolved from the fertiliser granules is retained by the soil and the concentration of phosphorus in the soil solution is higher. More phosphorus is available to the plants as their roots grow through that volume of soil. Incorporating fertiliser exposes more of the phosphorus to the soil components, therefore more phosphorus is retained. However, substantial crop benefits such as early and more even growth can be gained by incorporating the fertiliser, as the plants have access immediately after transplanting, as the fertiliser surrounds the transplanted root ball. Experimental work using incorporated fertiliser led to an increase in early crop growth, average curd or head weight and marketable yield as well as fewer harvests required to remove the crop. The same results have been observed by commercial cauliflower and broccoli producers. Commercial producers have also reported there is less chance of ‘fertiliser burn’ of the roots of transplanted seedlings when incorporating the fertiliser. Fertiliser burn of the roots may occur when fertiliser is banded, as the seedlings can be transplanted directly on top of the fertiliser band if there is a slight movement sideways of the transplanting machinery. When fertiliser is strip incorporated it is less concentrated and mixed evenly around the plant roots. Fertiliser burn can hold back early crop growth. When using the strip incorporation application plant growth occurs soon after transplanting. The plant roots are surrounded by the fertiliser mixed through the soil, giving immediate access to phosphorus and other nutrients. For banded fertiliser, the plant roots first have to grow to the band to intercept the nutrients and this delay in the plant obtaining adequate nutrients can reduce early and subsequent growth. The early growth advantage when using incorporated fertiliser is carried through the crop life. When incorporating fertiliser it should contain a high level of water-soluble phosphorus. The incorporation method can be successfully used with fertiliser that has low water-soluble phosphorus content, if the background level of phosphorus in the soil is high (that is, the amount of phosphorus already present in the soil is high from application of fertiliser in previous years). This is often the case if vegetables are grown after pasture and the pasture has been topdressed regularly with a fertiliser containing phosphorus. Trials of liquid pre-plant fertiliser comparing banded and strip incorporated application methods also found the strip incorporation method gave growth and yield advantages. This method has been used commercially for lettuce crops. Sections of this webpage are based on a farmnote authored by Rachel Lancaster and Phil Ross.